I forgot what grass looks like. Seriously. It's been a couple of weeks since I've seen any. I might have to search Google Images to refresh my memory. We've been sequestered here in the T house for weeks on end, more or less, and my mind has started to wander. When I'm not dreaming of lying on a beach, drinking daiquiris and being fanned by a pool boy, I start to dream more realistically about the upcoming glory that is called Thrifting Season! Thrifting Season is like what I imagine hunting season must be like, only so much more exciting and hopefully less violent. I've yet to shed blood at a yard sale. Yet. Plus, you don't have to have a license to go thrifting. It's all the thrill of the hunt. When the weather warms up around here, Thrifting Season is when the Salvation Army starts to bulk up their "showroom" and yard sales start popping up all over town each weekend. I have a wish list this year...a short list so far, but a list, nevertheless. Here are a few of the items I'll be on the lookout for come Spring. ~It's not technically a "thrifty" find, but I am hoping to make a trip up to IKEA soon and browse their cubbies and bookshelves. I saw something I really liked last time I was there, but I can't find a photo of it on their site to save my life. So you'll have to take my word for it. I'm sure I'll add to this list the more I think about it. I like your list! 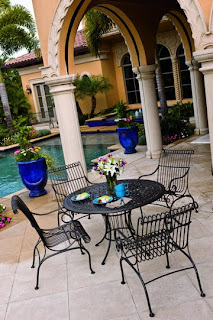 Although if you happen upon a source for the patio furniture that includes the pool, there could very well be bloodshed. I imagine you'd have to fight for it. I want a cool table for my front porch. Preferably fairly tall and square. To go beside my front door. I have just the thing in my mind, although I've never seen a picture of it. I'm just thinking that I have the perfect spot for this phantom table. And, of course, I'd like for it to cost $15 or less. Thank you very much. Most of my thrifting is haphazard, catch-as-catch-can. The idea of making a list is a good one! Wish we had an Ikea close by. Last night I dreamed about that store...really! Love that bench. I have at least three spots in my house that could use something similar. Every time something like that comes up on CL they get scooped up faster than I can get to them! I'm excited! I haven't been to a yard sale in God knows how long but I'm excited to try this season. I haven't been to the salvation army since I was in Elementary school either so we're due for a visit there! lol! I'm with you!!! I don't have a list but I think it's a great idea. As far as Ikea, I'd say it counts as thrifty. I love that store!! I don't go nearly enough (it's only like 15 - 20 miles away). I actually saw a sign for a yard sale last weekend - and we had snow on the ground in Atlanta. Crazy! I have quite the lengthy list, so Mother Nature needs to cooperate with nicer weather and the yard sales need to commence! Plus it's too cold to spray paint outside and for some reason my husband won't let me do it inside. Good list! Can we take your pool and split it in half and send the rest to me? We only need a sliver of a pool, my kids are small. The only thing on my list to find is a new home, that's not very thrifty is it? Hmmm.. And, I should probably sell mine first. Shoot. Love the hunting analogy. It is just as exciting (if not more), and I too have never shed blood at a garage sale. Although I nearly came close when a woman headed for my quilting mat, square, and ofla cutter, all of which I scored for $5 total. It would have gotten ugly if she didn't back down I tell you! Speaking of garage sales, there were two signs in my community this weekend. And if where you live is anywhere like here, I was shocked. I mean it was only about -10° but still...that might be pushing it! I'm hoping to find a bench for the foot of our bed, preferably with storage and one that I could reupholster the cushion. As well I would love to find a new computer desk. Nothing too fancy, but with lots of storage, and paintable! Not sure if I have a particular item I"m looking for.......something grand! I am sooooo ready for the snow to go away!!! I love your list. I too am looking for a patio set. Also a copper tea set for the top of my kitchen cabinets. How much fun would we have thrifting together? I'm with ya girlfriend, it's just too darn cold here too...and I'm in North Carolina for goodness sakes! Love the bench! Regarding the plates, I goto the Restore here in Charlotte, and they always have a ton of white plates in all shapes and sizes for like $1. Do you have a Restore where you live? Oh you know I'm all about Thrifting season! I'm also looking for a cool bench for our front porch. I have the pillows, but no bench! Poo! Also, the patio revamp will be all thrift finds. So far, I've found a Frontgate teak folding chair (on trash day, hollah!) and yesterday I found a bright turquoise ceramic garden stool at Big Lots marked down to $10 because of a small scratch! Not free, but thought it was a great deal. The rest will be pieced together as I find stuff. I hope to be putting it all together soon. Oh, I love thrifting season! My hubby lets me leave the kids home with him nearly every Saturday morning while I drive around from garage sale to garage sale, finding all sorts of treasures. A list is a fabulous idea! What would be on mine...jeans for both kiddos, church dresses for Miss Mae, cushions for patio set (that I took of someone's curb on large pick up day), crafting supplies, stuff for space themed vacation Bible school, and who knows what other treasures I will find! Now I'm excited too! Yay! A coffee table is on my list. But I may make it from a square table I have in there now. Just need to add a top and some wheels and it will be good to go!! Your list sounds doable for sure. Happy hunting...coming soon!! I love "sale-ing" season! I finally had the idea to start a list this year! It's starting to grow as I look to redecorate for spring. The one biggie is a bench for the back door in the kitchen to store shoes. Oh, and a farm table for the kitchen. I'm lovin' the bench. I'd paint it black too! I hope I get to hit some garage sales this year. I'm actually excited about it for the first time EVER! I finally visited our Goodwill yesterday and the have NOTHING!!! I'm wondering if we'll ever see grass again, too. Maybe lots of people will have done a big clean out since they've been trapped at home and they'll be yard sales left and right come April. I hope you find your wish list items. I'm excited because I've never had a car that could fit much in it, but recently we got a bigger car, which means I could score some great furniture. I live in San Francisco and I can't tell you how much free furniture I've scored off the street. Every room in my home has a "found" object in it. That bench is so cute ~ good luck on your hunt! We'll be hunting for plates too ~ a variety of mismatched 'fine' china to eat off of. And some items for the rec room, including some bookshelves, as it's currently just boxes upon boxes down there!